Aethelflaed Rises – Time to resurrect knowledge of the First Lady of the Mercians, queen, wife, mother, city planner and field marshal. As part of Gloucester’s Aethelflaed 1100th anniversary celebrations, members of the public are invited to take part in a geophysical survey on Saturday 26 May to search for the remains of the late Anglo-Saxon palace in Kingsholm. The site was partially excavated in 1972 (the Kingsholm Court area). Aethelflaed is thought to have ruled Mercia from the palace and it would continue to be used by royalty right up to the Norman era. Aethelstan, Aethelflaed’s nephew, the first true king of England would later pass away at the royal palace in 939. It would also have been used by Kings Edmund Ironside, Harthacnut, Edward the Confessor and William the Conqueror. This year marks the 1100th anniversary of the death of Aethelflaed, one of the most pivotal women in English history, who ruled from and was buried in Gloucester. As the ruler of the Anglo-Saxon kingdom of Mercia, she laid the foundations of the England we know today. Gloucester’s connection to Aethelflaed is indeed a strong one as she refortified the former Roman settlement and defended it from the Vikings, she ruled from the Anglo Saxon Palace in Kingsholm, she built St Oswald’s Priory to house the sacred relics of one of England’s most devoutly Christian kings and she was buried beneath the same building. There will be another opportunity to try your hand at archaeology at the Anglo-Saxon encampment at St Oswald’s Priory on Saturday 9 June. Members of the public will have the chance see what life was like in the tenth century and the encampment will host specially commissioned music, drama and spoken word performances inspired by Aethelflaed. Members of the public can enjoy free Saxon Tours of Gloucester to help set the scene and a special exhibition will be held at the Museum of Gloucester over the summer. Gloucester Cathedral will hold a special Evensong dedicated to Aethelflaed on the actual anniversary, Tuesday 12 June. There are few mentions of Aethelflaed of Mercia in modern secondary scholarship, and only tantalizing information on her in the primary sources. Most secondary sources outlined the basics of Aethelflaed’s place in history –admittedly a small part in the unification of England from Alfred to Aethelstan. Despite this, I always suspected there was more to Aethelflaed’s story than we could get to; another forgotten memory destroyed by the vagaries of time and the chronicler’s pen. And then, during a lecture on Alfred’s kingdom in my Medieval English History course, a student excitedly raised his hand as I spoke about Edward’s role in the destruction of Aethelflaed’s realm in Mercia. A native of Ireland, he said he’d heard stories about Aethelflaed from his grandmother, stories that dwelt on English perfidy against rightful rulers. I asked him to write the story down for me, as best he could recall. His tale outlined Aethelflaed and her daughter as the rightful rulers of Mercia, rulers who had close connections and warm relations with Irish kings. This remained true until Aethelflaed’s death, when Edward claimed Mercia as his own and killed his niece, Alfwynn. The story ended with Aethelflaed and Alfwynn being invited to live with the Tuatha de Danaan in their barrows under the earth, as rightful queens and beautiful women, where they then became responsible for deceitful tricks against any English on Irish soil, or against any English sympathizers. I was taken aback by two ideas: one, I could get oral histories from the Middle Ages, and two, I now had a small morsel of proof that Aethelflaed had been more than “Lady of the Mercians” and that her story had lived long past her small part in the Anglo-Saxon Chronicle. Unfortunately, I could not get the story corroborated with the student’s grandmother, as she had died a few months prior. But this oral history led me to read the primary sources with new eyes — Aethelflaed’s history, written by her native Mercians, her neighbors the Irish and the Welsh, and by her Wessex conquerors and kin. Aethelflaed, Queen and Lady of the Mercians, ruled the Anglo-Saxon kingdom of Mercia from 911-918. With both a dead husband and father and Danish invasions into Anglo-Saxon territory increasing, Aethelflaed not only held her territory but expanded it. She was a warrior queen whose Mercian army followed west to the Welsh and north to the Danes. She lost two battles and won at least three. Writers extolled her for her bravery and her cunning. Trying to piece together Aethelflaed’s reign in Mercia, we find bits and pieces of her in charters, annals, poems, and stories. Aethelflaed should be an Anglo-Saxon icon; however, she is barely a footnote in mainstream contemporary Anglo-Saxon sources. Interestingly, Aethelflaed is also not paired in an obligatory fashion to any of the men in her life in the primary sources. She is not Aethelflaed, daughter of Alfred, sister of Edward, wife of Aethelred. She is Aethelflaed, Lady of the Mercians. Even most modern historians always link Aethelflaed to her male relatives. She is, however, consistently paired with men in the majority of the modern secondary sources. For example, F. T. Wainwright’s first sentence places Aethelflaed in context to the men in her life: “Aethelflaed was the daughter of Alfred the Great, sister of Edward the Elder, the wife of Ealdorman Aethelred of the Mercians and herself ruler of the Mercians for seven years after her husband’s death.”  More modern scholars attempt to place Aethelflaed in her context, but the men still take center stage. Helen Jewell does not mention Aethelflaed at all in her 2007 monograph on women in early medieval Europe and has only a short paragraph describing Aethelflaed’s biography in her book on 1997 medieval English women – and she writes twice as much on her husband Aethelred. Most modern historians center their brief discussions on Aethelflaed as a military leader. Pauline Stafford calls her one of the greatest warrior queens of the age. Christine Fell’s Women in Anglo-Saxon England devotes four pages to Aethelflaed. 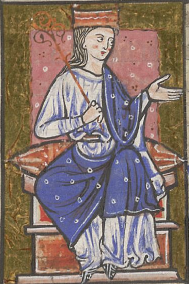 David Jones writes that Aethelflaed “vowed a life of chastity after nearly dying in childbirth” and applied her energies to military pursuits, echoing William of Malmesbury. The more scholarly Battle Cries and Lullabies repeats the idea about Aethelflaed’s chastity but presents a more nuanced view of her military campaigns. These descriptions of Aethelflaed are so common to be unremarkable – why would not we see Aethelflaed as an extension of her father Alfred’s military campaigns? Yet, in many of the primary sources, though brief, the mentions of Lady Aethelflaed seem to offer us much more than merely a daughter of a mighty military king. The Anglo-Saxon Chronicle is our most important source for the Anglo-Saxon period and that also holds true in searching for Aethelflaed. There are other chronicles that mention Aethelflaed in passing: Asser’s Life of Alfred the Great, Aethelweard’s Chronicle, the Annales Cambriae, and the Irish chronicle The Three Fragments contain information important for the study of Aethelflaed. Sources outside the traditional Anglo-Saxon Chronicle, like the Mercian Register, the Charters, and the Irish Annals, show how Aethelflaed’s story has become part of a subversive history – the history of the conquered or almost conquered – pitted against the canonical history written for the conquerors. These subversive sources use her reign and the subsequent absorption of Mercia into Wessex as part of a wider narrative that undermines the ideology of Wessex conquest. Viewing all these sources shows us how her rule as Queen of Mercia functioned as complement to her father and brother’s consolidation of England against the Danes and as a corruption against that consolidation. One of the most important sources we can examine is the Anglo-Saxon Chronicle, a complicated text compiled from seven manuscripts and two fragments, and a unique source of information about England from the ninth to twelfth centuries. The Main, or Canonical, Chronicle is cited as versions A, B, C, and D. Written exclusively in a monastic setting, this source is perfectly placed to show how monks viewed the role of women in their world. The Chronicle is an annalistic history. A monk jotted important notes about a specific year within the text. Occasionally, dates would be written in advance, and a monk would have to fit details into a small space. Other years would be less busy, with only a death or a comet for mention. There is very little of the narrative style that gives us so much detail. The Chronicle may read like a mere listing of achievements, but it is far more than that – each entry has significance and meaning. We should read the stories concerned primarily with women with this in mind – that the chronicler chose to craft each entry with forethought and energy. As monks, the chroniclers had a calling far more important than that of author. Their lives were dedicated to God, not to history. Yet their brief reports are accounts of significant activities surrounding the monastic environment. These were events noteworthy enough to rouse the monk from prayers and into the scriptorium. While the chronicle may lack attempts at characterization or narrative, the fact of an event’s inclusion shows us that the monk felt it a thing worthy of memory. Asser wrote the Life of Alfred late in 893. Concerned with portraying his patron as a great king, particularly to newly conquered areas, there is little negative information about Alfred. Because the work ends abruptly in 893, before Aethelflaed’s rule in Mercia, Asser’s work provides us with only a few details of the girl before she became the ruling woman. Aethelflaed was the first child of King Alfred the Great of Wessex and his Mercian wife, Ealhswith. Asser leads us to believe that, because she and her sister Aethelgifu were born before her father’s educational program was complete, neither of them benefited from his interest in education. He tells us that Alfred’s two sons, Edward and Aethelweard, and his youngest daughter Aelfthryth were brought up with tutors and that they were “devoted and intelligent students of the liberal arts.” Perhaps Aethelflaed was too old to profit from Alfred’s new program. Still, as the eldest daughter of Alfred, she was important to her father and in 882/3 he married her off in a politically expedient move. The story of Aethelflaed appears mainly in the Mercian Register, inserted subsequently into the Anglo-Saxon Chronicle. The oldest manuscript of the Anglo-Saxon Chronicle, cited as A, does not use the Mercian Register. The Register was, however, added to manuscripts B and C “without any attempt to dovetail its annals into those of the Chronicle.” The register forms then a discreet part of the Chronicle. As B and C have no entries for the years 915 to 934, the Mercian Register fills a gap within those manuscripts. The D and E forms of the Chronicle also use the Mercian Register, but here the register is inserted into the regular annals. The E version is closely tied to the D form and has interpolations of the Mercian Register. The Mercian Register gives us the fullest account of Aethelflaed’s life and of the Mercian conquest at her death. It disappears from the Anglo-Saxon Chronicle as abruptly as it appears. The last entry is in 927 when Athelstan succeeded to the kingdom of Northumbria and accepted the oaths of other kings on the island. The majority of the entries of any significant length concern Aethelflaed – she is in eight of the twenty notes. Two of the remaining twenty concern celestial events, one details a saint’s translation, five happened after her death, and the remainder concern Aethelflaed’s immediate family – her father’s death, her brother’s accession, her husband’s death, and her daughter’s removal. At Alfred’s death around 900, his son Edward succeeded to a divided and invaded land and faced a contested inheritance in the form of his cousin Aethelwold and his Danish allies. He needed support from his father’s allies, and he found such support through his sister Aethelflaed and her husband. In 903, Aethelwold and his army “harried all over Mercia” and the Mercians joined Edward against Aethelwold and the Danes. Battle broke out again in 910 and the Mercians had a great victory at Tettenhall, killing many Danish men. Notwithstanding it being a Mercian victory, the battle is mentioned in versions C, D, and E and in the Mercian Register in the Anglo-Saxon Chronicle. Shortly after the battle at Tettenhall, Aethelred died, perhaps as a result of wounds he received during the battle. With Aethelred’s death, Aethelflaed would seem able for the first time to act as independent leader. F. T. Wainwright suggests that Aethelred was in poor health for much of his reign, stating that he “could do no more than offer advice from a sickbed.” His sources for Aethelred’s continuing illness are the Irish Three Fragments, where Aethelred is “in a disease” from at least 902, and a mention from Henry of Huntingdon, who wrote that Aethelred was “long infirm” before his death. Wainwright states that we can believe these sources since Aethelred sent his army to battle alone in 909 and 910 and was not involved in the building of Bremesbyrig with Aethelflaed in 910 and therefore must not have been in any condition to command or direct Mercian efforts. This makes Aethelflaed ruler of Mercia as early as 902. Nevertheless, it is in 910 when Aethelflaed began her concentrated building program without her husband’s assistance that we truly see her as leader of Mercia. When viewing Aethelflaed’s building processes, we must look to her father for instruction. Her construction of boroughs (or burhs) continued a process her father had begun during his reign. Alfred’s building campaign was a system of defense meant to protect his territory from Danish incursions. Wainwright links this building program to part of a national system, conceived by Alfred and continued by Aethelflaed and her brother. Based on a reading of the tenth-century document “Burghal Hidage,” Alfred’s burhs were designed to be permanent settlements of people and fortresses for his semi-permanent garrisons. Richard Abels writes that “the defensive system that Alfred sponsored, and its extension to Mercia under Ealdorman Aethelred and the “Lady Aethelflaed”, enabled his kingdom to survive.”  The burghal system of Wessex “became a tool for conquest and territorial consolidation after his death. Each stage of the conquest of the Danelaw by Edward the Elder, Ealdorman Aethelred and the Lady Aethelflaed was marked by the construction and manning of burhs.”  In fact, a Mercian charter talks of the building up of Worcester by both Aethelred and Aethelflaed “for the protection of all the people.”  The building of burhs, particularly for defense, shows us Aethelflaed’s military and social stratagems. She might not have held the formal title of queen for the Wessex monastic chroniclers, but she behaved like one. Early in her rule, the burhs of Gloucester, Hereford, and Worcester were built. Aethelweard writes that the Danes had built fortifications in Gloucester in 877, so re-building this city as Mercian may have been of importance to Aethelflaed and her husband. Of the eleven towns built during Aethelflaed’s reign, five were on the border with Wales. Although poorer in resources, the Welsh border was still a significant area that needed protection. Welsh leaders had taken oaths of loyalty to Aethelred, which probably extended to Aethelflaed upon his death. However, in 916, a Mercian abbot was killed while in Welsh territory. Three days later, Aethelflaed sent an army into Wales where she destroyed Brecenanmere and took thirty-four hostages, including a Welsh king’s wife. Aethelflaed thus proved that she was not to be discounted in the military arena. She continued to fortify towns and assist her brother in repelling the Danish forces for the next two years. Her remaining seven burhs were situated along Danish borders. Some, like those of Tamworth and Stafford, were even in Danish-held lands. Aethelflaed and her Mercian army focused on repelling the Danes to the north and west of Mercia. Wainwright suggests that Aethelflaed fought not only against the Danes, but also against the Irish-Norwegians who invaded Northumbria in 914. She fortified two burhs in 914/915, Eddisbury and Runcorn – both of which were further north than those burhs in central Mercia that were directed against the Danes. According to the Three Fragments, Aethelflaed directed these fortresses against the Irish-Norwegian leader Ragnald, whom she met in battle in 918 where “her fame spread abroad in every direction.” Wainwright suggests that Aethelflaed was the active leader against the Norwegians and that Edward was forced to step into this role once she died in 918. New towns were a part of Alfred’s defensive scheme against the Danes and we can assume the same for the towns built by his daughter and son. While Aethelflaed concentrated on building burhs in the northwest portion of Mercia, Edward built fortifications in the east, only moving north after his sister’s death. We can see, then, that Aethelflaed’s building continued her father’s protective stance. 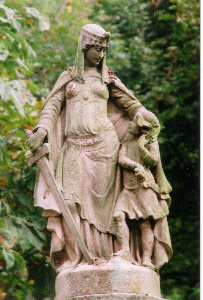 Aethelflaed acted as a military commander when she built burhs in her territory. We cannot doubt that the creation of burhs impressed Alfred’s, and Aethelflaed’s royal power upon their subjects, both old and new. The building processes might also have been her way of solidifying her own power over Mercia and of signaling this power to her enemies, her subjects, and perhaps even her brother. The sources tell us little about the relationship, personal or otherwise, between Aethelflaed and her brother Edward. In fact, we do not sense any tension between the siblings until after Aethelflaed’s death. With her death, the cooperation between Mercia and Wessex was at an end and Edward needed no more pretext to Mercian freedom. In 918, the Mercian Register reports that she “died twelve days before midsummer in Tamworth, in the eighth year in which with lawful authority she was holding dominion over the Mercians.” Version A tells us that Edward “occupied the borough of Tamworth, and all the nation in the land of the Mercians which had been subject to Aethelflaed submitted to him.” The Mercian Register completes our description of Edward’s capture of Mercia from Aethelflaed’s daughter, Alfwynn, who was “deprived of all authority in Mercia and taken into Wessex.” We can surmise that Aethelflaed meant her daughter to succeed her, as the Mercian Register confers upon her “authority” in Mercia. And, since Edward needed to “occupy” Tamworth in order to subject the Mercians to his authority, Alfwynn must have actually held some authority there. All these events happened directly after Aethelflaed’s death in Tamworth, indicating a sudden regime change. Aethelflaed was obviously of importance to the Mercians and to the men who wrote these telling annals. Since we also have versions of these events from sources far later than during her life, we can see that it was easy to tell the same story without having Aethelflaed in evidence. During the same period, in the Canonical Chronicle, she is mentioned by name only at her death, in version A. The Mercian army, as commanded by Aethelflaed, is mentioned three times in the versions A, C, and D. The Mercian monks could also have written this story without its main actor, but they chose to include her and her most significant events, both before and after her husband’s death. For monks whose allegiances and family ties most probably lay within the district of Mercia, Edward’s abrupt invasion of Tamworth and his removal of Alfwynn must have struck these writers as close to the military advancements he had made on London and Oxford, two former Mercian cities. The canonical tale here is of Edward finishing his father’s consolidation of England under one king. To the Mercians, it may well have felt like a new invasion. We can also gauge Aethelflaed’s importance by looking at another type of historical source: the Anglo-Saxon charter. She does not appear in these written records until she attests to her first charter, S 221, in 901. In it, she and Aethelred appear as “rulers of Mercia” and they exchange land with a church and grant a gold chalice to an abbess. She appears with Aethelred in one other charter (S 223) and on her own in two charters (S 224 and S 225). Interestingly, the reliability of all five charters in which Aethelred appears alone has been questioned. Only one of Aethelflaed’s charters has received such a charge. In total, Aethelflaed appears in four of nine charters for the period between Ceolwulf II and Edward the Elder (874-924). This is more frequent than any previous Mercian queen, most of whom only appear once. Prior to Aethelflaed, Mercian queens appear in three of forty-nine charters. Of 604 charters of the West Saxons and Wessex, only one queen, Frithugyth, Aethelweard’s wife, appears as a co-benefactor (S 253). Out of the total 1163 Anglo-Saxon charters, queens appear as co-sponsors only twelve times. This gives Aethelflaed one-third, and Mercian women over half, of all the representations in 400 years. The charters represent Aethelflaed’s actions: she works in concert with her husband before his death and she acts alone in her widowhood. Much of the belief in Aethelred’s and Aethelflaed’s submission to Alfred and Edward comes from their lack of royal titles and coinage. While there is a lack of royal title, both the kings of Wessex treated Aethelred and Aethelflaed as allies. In three Wessex charters, S 367, S 367a, and S 371, Edward acts “with Aethelred and Aethelflaed of Mercia.” Edward’s charters all concern requests made by a duke Aethelfrith – the land in question existed in border areas between Mercia and Wessex. Edward may have been acting in concert with the Mercian rulers to stave off any accusations of impropriety in oft-disputed territory. 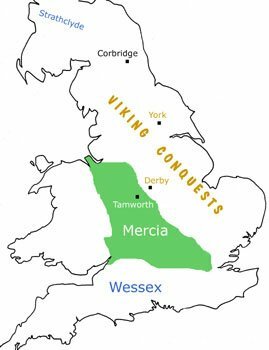 Mercia was the weaker territory, but it nonetheless avoided external invasion, at least during Aethelflaed’s lifetime. The Annals of Ulster, the most prominent of Irish Chronicles, lists Aethelflaed only at her death: “918. Ethelfled, a very famous queen of the Saxons, dies.” These annals often list the deaths of queens and prominent women; from 439 to 1047, twenty-three women’s deaths are mentioned. Of those twenty-three women, only three are mentioned without their concomitant men: the Saint Brigid, an Abbess of Cell Dara, and Aethelflaed. Aethelflaed is not mentioned in the Annals of Tigernach or the Annals of Inisfallen, despite those two chronicles taking much of their information from the Annals of Ulster. These two works only mention women without their male relatives in two instances: Brigid and Abbesses. Wainwright suggests that Aethelflaed fought not only against the Danes, but also against the Irish-Norwegians who invaded Northumbria in 914. His evidence was the Fragmentary Annals and the Three Fragments. According to the Three Fragments, Aethelflaed directed these fortresses against the Irish-Norwegian leader Ragnald, whom she met in battle in 918 where “her fame spread abroad in every direction.” But it is in the Fragmentary Annals where we receive our most tantalizing view of Aethelflaed. These annals were probably written prior to 1040 and the relative brevity of years (covering the years 573 to 914) is matched only by their verbosity and storytelling. Using earlier annals like Ulster as a source, the chronicler also included bardic tales and the delightful flights of fancy of the medieval historian who includes conversations and details to bring his annals to life. Fragmentary Annal 429 begins in 907 and abruptly ends in 914. The annal concerns the Norwegians in Britain and their encounters with Aethelflaed, Queen of the Saxons. Like other sources, Aethelflaed’s agency is direct and active: at signs that the Danes were amassing in Chester, “The Queen then gathered a large army about her from the adjoining regions, and filled the city of Chester with her troops.” We are told that the Queen “holds authority over all the Saxons” and she specifically requests Irish help in defeating the Danes at Chester. She actively commands the battle and ends the seizure of the city: “The pagans were slaughtered by the Queen like that, so that her fame spread in all directions. Aethelflaed, through her own cleverness, made peace with the men of Alba and with the Britons, so that whenever the same race should come to attack her, they would rise to help her. If it were against them that they came, she would take arms with them. While this continued, the men of Alba and Britain overcame the settlements of the Norwegians and destroyed and sacked them.” Thus ends the Fragmentary Annal, with Aethelflaed making peace with the Irish and Welsh and commanding the island of Britain against the Scandinavian invaders. No mention is made of Edward or Alfred. Little mention is made of her husband, Aethelred, except his illness and death. The strong warrior who consolidates England is a woman. And while she is a Saxon, she rules the entire south without a distinction made between Wessex and Mercia. Edward was forced to step into his sister’s role as defender against the Danes on the northern border once she died in 918. This can be evidenced by the two burhs Edward built in 919 directly north of Aethelflaed’s. It is not terribly unusual that the Irish sources would not write about Anglo-Saxon history – with Viking invasions and settlements of their own, and various kings battling for supremacy, Irish history was itself enough for the chronicles. None of the annals mention Alfred’s rule. The Annals of Ulster mention Aethelstan’s death and very few other Anglo-Saxon rulers. If the Anglo-Saxons make so few entrances into Irish history, can these two mentions of Aethelflaed truly be subversive? The battle scenes in the Fragmentary Annals are detailed and complex (boiling cauldrons, beehives, and tunneling) and the peace treaty is outlined with a complete speech from the Queen’s messenger. The Annals all detail Colum Cille’s conversion of the pagans in the North of England. The Viking invasions had brought the British Isles into closer proximity than they had been in years. For two annals to detail Aethelflaed as an important queen seems significant. In the histories, Brigid is the only other woman who receives so much from the chroniclers. In the Irish ballads and legends, the poets often portray strong, often dangerous, and always beautiful women – and their men fare no differently. In the Fragmentary Annals, I believe we see a combination view of Aethelflaed. She met the requirement of Irish hero: she was a strong, dangerous, warrior able to throw off a foreign yoke – a yoke familiar to all the Irish writers. Ian Walker suggests that the Mercian nobles accepted Aethelflaed as ruler as a way to keep Mercia independent from Wessex. The nobles did not seek Edward’s protection, and Edward did not advance into Mercia at Aethelred’s death. Instead, they chose to maintain Mercia and its traditions by supporting their Lady and her daughter, the latter of whom could later be married to an ealdorman, who in turn would rule them as king. Aethelflaed remained a widow in the seven years between her husband’s death and her own, thereby smoothing the way for her daughter’s accession and maintaining her own power. Whether this was her choice, the Mercian noblemen’s choice, or her brother’s, we do not know. We do know that Edward did not challenge her supremacy in Mercia, although he did gain control over London and Oxford, traditionally Mercian cities. We may believe that the Wessex writers had more than a passing interest in removing Mercian players from the scene. And in reading those annals from outside of Wessex control, we do see Aethelflaed as a strong queen and leader of the Mercian forces. Aethelflaed is remembered, even in the tersest of contemporary sources, as the Mercian leader and a builder of military garrisons. But when we look at Aethelflaed in a larger context, outside of the canonical history written in the Anglo-Saxon Chronicle, we find a woman as strong as her father and brother, a woman whose territory ceased to be a kingdom after her death. Further work with Irish and Welsh oral histories may bring more new light to Aethelflaed and other lesser-known figures, figures who became sites of resistance and subversion against the stronger story of English hegemony. Perhaps Mercia needed to fall, for the larger story of Anglo-Saxon England to be complete. But in the Mercian Register and in the Irish Annals, I believe we see the hegemony of Wessex questioned, through the rule of a strong, and nearly forgotten, queen. Richard Coates, “Aethelflaed’s Fortification of Weardburh” in “Notes and Queries,” March 1998 60 (1), pgs. 8-12, where Coates is attempting to identify to places to the title Weardburh, with Aethelflaed hardly mentioned; Pauline Stafford has written more extensively on Aethelflaed in her works on tenth-century England. See Queens, Concubines and Dowagers, and Unification and Conquest: A Political and Social History of England in the Tenth and Eleventh Centuries, and Gender Family and the Legitimation of Power: England from the ninth to early twelfth century, among others. William of Malmesbury, Chronicle of the Kings of England, trans. J. A. Giles (London: Henry G. Bohn, 1847; reprint, 1968), 123. Jewell, Women in Medieval England, 39, Jewell, Women in Dark Age and Early Medieval Europe. Pauline Stafford, Queens, Concubines, and Dowagers: The King’s Wife in the Early Middle Ages (Athens: University of Georgia Press, 1998). Fell and Cecily Clark, Women in Anglo-Saxon England and the Impact of 1066, 91-93. David Jones, Women Warriors: A History (Dulles, Virginia: Brassey’s, 1997; reprint, 2000), 57. While this is a popular history with many errors (for example, Jones has Aethelflaed fighting with Alfred in 912, long after his death), his evidence directly points to the sources he consulted. Linda Grant De Pauw, Battle Cries and Lullabies: Women in War from Prehistory to the Present (Norman: University of Oklahoma, 1998), 83. Fell and Cecily Clark, Women in Anglo-Saxon England and the Impact of 1066, 12. Aethelweard, The Chronicle of Æthelweard, xxix. Aethelweard, The Chronicle of Æthelweard, ed. A. Campbell (London: Thomas Nelson and Sons Ltd, 1962), Alfred the Great: Asser’s Life of King Alfred and Other Contemporary Sources, trans. Simon Keynes and Michael Lapidge (New York: Penguin, 1983), Annals of Ireland: Three Fragments, trans. Duald Mac Firbis and John O’donovan (Dublin: Irish Archaeological and Celtic Society, University Press, 1860), Annales Cambriae, trans. John Williams Ab Ithel (London: Longman, Green, Longman, and Roberts, 1860). Dorothy Whitelock, ed., The Anglo-Saxon Chronicle (New Brunswick, New Jersey: Rutgers University Press, 1961), xi. Whitelock, ed., The Anglo-Saxon Chronicle, 61. Alfred the Great: Asser’s Life of King Alfred and Other Contemporary Sources, trans. Simon Keynes and Michael Lapidge (New York: Penguin, 1983). Pauline Stafford, “Political Women in Mercia, Eighth to Early Tenth Centuries,” in Michelle Brown and Carol Ann Farr, Mercia: An Anglo-Saxon Kingdom in Europe (London: Leicester University Press, 2001), 45. Asser, Alfred the Great: Asser’s Life of King Alfred and Other Contemporary Sources, 323, n. 391. Whitelock, ed., The Anglo-Saxon Chronicle, xi. Whitelock has a good introduction to the Chronicle which outlines each version and its peculiarities. Whitelock, ed., The Anglo-Saxon Chronicle, xiv. Whitelock, ed., The Anglo-Saxon Chronicle, 59-60. Walker, Mercia and the Making of England, 94. Damico and Olsen, New Readings on Women in Old English Literature, 46. Annals of Ireland: Three Fragments, 227. Henry of Huntingdon, Historia Anglorum, trans. Diana Greenway (Oxford: Oxford University Press, 1996), 167. Abels, Alfred the Great: War, Kingship, and Culture in Anglo-Saxon England, 199. Abels, Alfred the Great: War, Kingship, and Culture in Anglo-Saxon England, 217-218. Della Hooke, The Anglo-Saxon Landscape: The Kingdom of the Hwicce (Manchester: Manchester University Press, 1985), 104. Aethelweard, The Chronicle of Æthelweard, 42. Whitelock, ed., The Anglo-Saxon Chronicle, 64. Brecenanmere has been identified as Langorse Lake, near Brecon. Annals of Ireland: Three Fragments, 247. Damico and Olsen, New Readings on Women in Old English Literature, 52. Whitelock, ed., The Anglo-Saxon Chronicle, 64. Damico and Olsen, New Readings on Women in Old English Literature, 49. Whitelock, ed., The Anglo-Saxon Chronicle, 67. Sawyer, Anglo-Saxon Charters: An Annotated List and Bibliography. http://www.esawyer.org.uk/about/index.html Accessed June 14, 2013. The Annals of Ulster to 1311, http://www.ucc.ie/celt/published/T100001A/index.html. Accessed June 14, 2013. FA 429. http://www.ucc.ie/celt/published/T100001A/index.html. Accessed June 14, 2013.